We’d love your help. 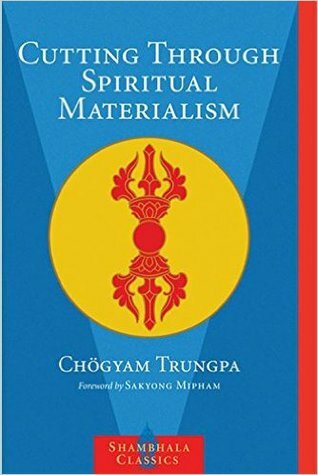 Let us know what’s wrong with this preview of Cutting Through Spiritual Materialism by Chögyam Trungpa. In this modern spiritual classic, the Tibetan meditation master Chögyam Trungpa highlights the commonest pitfall to which every aspirant on the spiritual path falls prey: what he calls spiritual materialism. The universal tendency, he shows, is to see spirituality as a process of self-improvement—the impulse to develop and refine the ego when the ego is, by nature, essent In this modern spiritual classic, the Tibetan meditation master Chögyam Trungpa highlights the commonest pitfall to which every aspirant on the spiritual path falls prey: what he calls spiritual materialism. The universal tendency, he shows, is to see spirituality as a process of self-improvement—the impulse to develop and refine the ego when the ego is, by nature, essentially empty. "The problem is that ego can convert anything to its own use," he said, "even spirituality." His incisive, compassionate teachings serve to wake us up from this trick we all play on ourselves, and to offer us a far brighter reality: the true and joyous liberation that inevitably involves letting go of the self rather than working to improve it. It is a message that has resonated with students for nearly thirty years, and remains fresh as ever today. To ask other readers questions about Cutting Through Spiritual Materialism, please sign up. I'd flipped through this many times before and read parts over the years, and it seems like there's always something new that stands out. This time, it's a reminder of what I love most about the Buddhist approach to the awakened state: that it's something that always exists, not something we need to try to create. Over the last year or so, I've seen (and been part of) so much striving and so much reaching, working, studying intensely, and taking Oh So Seriously the spiritual life ~ an approach t I'd flipped through this many times before and read parts over the years, and it seems like there's always something new that stands out. This time, it's a reminder of what I love most about the Buddhist approach to the awakened state: that it's something that always exists, not something we need to try to create. Over the last year or so, I've seen (and been part of) so much striving and so much reaching, working, studying intensely, and taking Oh So Seriously the spiritual life ~ an approach that, of course, only confuses matters. When in reality, the awakened state is an act of just being. Just being sane. Just letting be. I see it happen with my yoga students and peers all the time: they practice yoga for some period of time, then start getting really excited about the spiritual side of yoga, and then start doing all this reading and doing all these other practices and making all these rules that they believe they must follow in order to "stay on this spiritual path." And it's like as soon as they start adding all this other stuff, they lose the spiritual high that they got in the first place, so instead of going back to the simple method, they add more stuff and more stuff and they must meditate and practice every single day and avoid certain foods and beat themselves up if they have certain thoughts or emotions and it's all So Serious and Heavy and a Big Deal, when in reality, it's self-defeating. This book is a great reminder of the quite simple experience of just now. Of not identifying with our spiritual highs and then seeking to always be in that exact moment (adding on all these things to do and these rules of living in order to always "stay high"), but of allowing and understanding moments as moments and continuing to observe and be in the flow no matter the moment. We do not consider how we are going to vomit; we just vomit. Chögyam Trungpa was a charismatic and controversial figure in the Western popularization of Buddhism. As a teenager in Tibet, Trungpa fled the Chinese in an escape that involved swimming across a river under gunfire, climbing the Himalayas, and running so short of food that he had to eat his leather belt and bag. Eventually he emigrated to the United States, where he founded several schools, and pioneered a secular interpretation of Buddhism, Shambhala Training. You may be surprised to learn that Trungpa, far from being an ascetic monk, also had notorious penchants for bedding his female students and for going on drunken debauches. My interest in Trungpa was sparked by reading a book on meditation by his disciple, Pema Chödrön, which I thought was excellent. Spiritual Materialism, Trungpa’s most famous book, contains two series of lectures Trungpa gave, in 1970-71, about the pitfalls of the spiritual path and how to overcome them. As such, this series of lectures is largely theoretical rather than practical—how to think about the spiritual path rather than what to do once you’re on it—even if there are practical ramifications. ‘Spiritual materialism’ is Trungpa’s term for the ways that the ego co-opts spirituality for its own benefit. ‘Ego’ is our sense of self. In Buddhist thought, this sense of self is illusory; the self is a process, not a thing. Ego is the mind’s attempt to create an illusion of solidity where none exists. Put another way, ‘ego’ is the mind’s attempt to reject impermanence. This attempt takes many forms. We modify our environment, manipulating the material world and bringing it under our control, in order to create a perfectly comfortable world that never challenges or disappoints us. We create intellectual systems—positivism, nationalism, Buddhism—that rationalize and explain the world, that define our place in the world and dictate to us rules of action. We also attempt to analyze ourselves: we use literature, psychology, drugs, prayer, and meditation to achieve a sense of self-consciousness, an awareness of who we are. All of these are the ego’s attempts to solidify both itself and its world, to see the universe as a series of defined shapes rather than an endless flux. It is no use, therefore, to practice acts of extreme asceticism, forceful acts of self-denial. It is no use to try to overcome your own negative qualities—to strive to be good, kind, caring, loving. It is no use to accumulate vast amounts of religious knowledge; nor is it beneficial to accumulate religious titles or honorifics. True spirituality is not a battle, not a quality, not an ultimate analysis, and it is not an accomplishment. All of those things belong to a person, whereas enlightenment contains no sense of me and not-me. This is my best attempt to summarize the core message of this book. (And please excuse the ponderous style; I've been reading Hegel.) Yet I’m not exactly sure how to go about analyzing or evaluating it. Indeed, such criticism seems totally antithetical to the ethos of this book. But I’ll try, nevertheless. There is an obvious contradiction between Trungpa’s stance on intellectual analysis—as the ego’s vain attempt to solidify its world through intellectual work—and the analysis that he himself undertakes in this book. If all analysis is vain, what makes his any different? To this, I think he would respond that analysis is fine if we take the right attitude towards it—namely, as long as we keep in mind that our analysis is not identical with the reality it attempts to describe, that we can never describe reality perfectly, and that there’s always a chance we are wrong. More succinctly, I think he’d say analysis is fine as long as we don’t take it too seriously. By his own admission, there is no ‘final analysis’ of the human condition; and enlightenment is characterized by the absence of any need to analyze. Still, there does seem to be the idea in Trungpa’s system that, in attaining this ego-less state, we are experiencing the ‘truth’ of reality, whereas before we were mired in the 'illusions' of the ego. In this, you might say that the system is esoteric: true knowledge is the purview of only the truly enlightened. True knowledge, in other words, is not transmissible through speech, but is the result of privileged state which only a few achieve. Bodhisattvas become authorities through their enlightened states, beings who must be listened to because of their special, higher perspectives. Again, I think Trungpa would respond that even the ideas of ‘knowledge’ and 'truth' are dualistic (they involves the sense of ‘me’ knowing 'something else'), and thus this idea is not applicable to the enlightened. Putting all this aside, it’s worth asking whether this ego-less state is even desirable. Could we have science, technology, literature, or love without a sense of self? An ego-less world might involve less suffering; but isn’t there something to be said for suffering? Trungpa describes the ego as a monkey creating various worlds—creating for itself its own heaven and hell, a world of animal desire and human intellect—and moving through these self-created worlds in a vain search for perfect happiness, only to have each of its own worlds collapse in turn. And yet, even if I accepted Trungpa’s premise that this struggle is vain, I still think it’s an open question whether perfect tranquility is preferable to vain struggle. "Ego is able to convert everything to its own use, even spirituality." Spiritual materialism can be defined as a self-delusion that some people have, when what they believe to be spiritual development is in fact strengthening their ego. It's a very common trapping for students of Buddhism (but not exclusively; it actually occurs in all spiritual disciplines), and by publishing the notes from his talks, Chogyam Trungpa wished to help his students understand how they could avoid falling into it. Sha "Ego is able to convert everything to its own use, even spirituality." Shallow spirituality can seem paradoxical, but it's more common than we might imagine. Many people are drawn to the esthetics of Eastern traditions (it is beautiful and exotic) and because they feel glamorous integrating parts of that in their lives (it does make one sound special and worldly, doesn't it? ), but in those cases there's rarely any depth or honesty to the practice. Sometimes the delusion is more subtle, like believing that following a teacher absolves the student of any kind of responsibility and power, that once there's been an enlightenment experience one doesn't need to work on themselves anymore, or simply the arrogance that having encountered insight makes one better than other people. Trungpa was a Tibetan monk, and while he loved the tradition he was initiated in, he also understood that some aspects of it could be distracting traps, especially for Western students (who live in a society where physical materialism is incredibly sophisticated), and he wanted to give them a strong understanding of the core of Buddhism - which really isn't about pretty flags, bells and other shiny things. He had an immense respect for Japanese Zen, and it shows in those lectures, and he emphasizes a lot of elements of Zen philosophy. The spiritual path is lonely. There is nothing to fall back on. "It could be a terrifying experience to have no one to relate to, nothing to relate with." I love this book. I first read it in the context of a reading group, and the collective feeling of discomfort in our discussions was palatable. As it moves along, the book becomes a little more complex. Trungpa goes further into Buddhism, to its psychology and understanding of mind, to the four noble truths, techniques of meditation, shuny The spiritual path is lonely. There is nothing to fall back on. I love this book. I first read it in the context of a reading group, and the collective feeling of discomfort in our discussions was palatable. As it moves along, the book becomes a little more complex. Trungpa goes further into Buddhism, to its psychology and understanding of mind, to the four noble truths, techniques of meditation, shunyata (nothingness), Buddhist ontology and epistemology (a philosophical turn), to compassion and even a brief bit on the tantra. This book is rich, and introduces a great deal. Any ideas of spirituality as something out there to attain, or as some kind of "self improvement" will be quickly struck down. This is definitely not a book for the new-agey, feel-good crowd. But on second thought, maybe it is. "Disappointment is the best chariot to use on the path of the dharma." This book is a record of a series of talks Trungpa gave to students in the early 70's. At the end of each of his talks, there is a Q&A with students, which produces some interesting questions and illuminating answers. Occasionally, readers are reminded of the times. At one point, a student asks Trungpa what would happen if the monkey - the metaphor he uses in explaining the 5 skandhas and the development of ego - took lsd. Overall though, the student dialogues bring a greater clarity to the topics at hand. It's hard not to walk away from an initial reading feeling paranoid and deeply questioning one's motives in spiritual practice. I would say that looking into oneself is a good thing, but too much self awareness can be paralyzing and counterproductive. The use of the word "cutting" in the title is apt for this reason. It could be thought of as an example of Trungpa's ruthless compassion or "crazy wisdom." Reading this book is certainly a jarring experience - the reader is severed from the comfort of previous ideas and hopes. Pre-conceptions and motives are exposed. This is not done to be cruel, though - it is a matter of being open and aware, and of using humor and wisdom in relating to the world as it is. Once again, I would definitely recommend this book to anyone interested in Buddhism, meditation, or matters of spirituality - it is an excellent and refreshing introduction that begs multiple readings. It's certainly one of my favorites. I find that most of my pursuits are spiritual in their ends, but that they are contingent upon material winnings. I took an aura photograph and saw a chakra reader recently, most of my friends having gone and received a "lower" chakra and being a color like orange or red or indigo at best. I got a "white color" aura photo and was told that I have a "crown chakra" (the highest, most enlightened of them all). It seemed fishy to me because I feel just as full of anxieties and self-doubt as any othe I find that most of my pursuits are spiritual in their ends, but that they are contingent upon material winnings. I took an aura photograph and saw a chakra reader recently, most of my friends having gone and received a "lower" chakra and being a color like orange or red or indigo at best. I got a "white color" aura photo and was told that I have a "crown chakra" (the highest, most enlightened of them all). It seemed fishy to me because I feel just as full of anxieties and self-doubt as any other person, I know just about as much of the truth of the Universe as anybody else. ("Well, maybe more than most people my age," I tell myself). I catch myself, and that is where I feel I am taking a bit of a left turn-- always telling myself that I am more "not of the flesh" than others, even though I use material means to achieve my spiritual goals, and then I re-use these spiritual experiences as if they were gathered like money or something tangible, rather than being mindful, and open, and in-the-present. This book is a good read for those of us who have hit the spiritual high our whole lives, often using not fraudulent, but just very accumulative, sometimes spiritually arrogant, methods of getting us there. This book is the most plain English explanation of the path of spirituality from the Tibetan Buddhist perspective I have ever read. It does not contradict what is taught by theistic religions and it describes all religions to be different methods of attaining the same goal. It has nothing to do with spirits or afterlife. It has everything to do with our subjective reality of the present moment. This book shows a path to a state of mind that allows you to flow like water through space and time ra This book is the most plain English explanation of the path of spirituality from the Tibetan Buddhist perspective I have ever read. It does not contradict what is taught by theistic religions and it describes all religions to be different methods of attaining the same goal. It has nothing to do with spirits or afterlife. It has everything to do with our subjective reality of the present moment. This book shows a path to a state of mind that allows you to flow like water through space and time rather than violently thrashing and splashing against the current as many of us currently are. The first talk is all about the common pitfalls of trying to attain realization. These delusions are especially prevalent in the West, where the interest in these teachings is fairly new and we are deeply entrenched in a materialist worldview. Spiritual materialism is when you have the thought, "I'm working on myself" or "I'm bettering myself". It is when, instead of gaining any insight into the universe as it is, this act of spirituality becomes just another thing you add to the collection of your identity. The goal of spiritual progression is to understand and see the eternal sameness of all things; to give up the notion of duality. Spiritual materialism is ego-reinforcing and becomes itself another form of duality. This is my 100th read of the year! Obviously, boasting about this is a form of spiritual materialism. Sigh. In a nutshell, spiritual materialism is that which accumulates within ourselves that obscures our ability to see things as they really are and hampers our ability to live within that context, without all the baggage of expectation and stress and judgment and egocentricity and so on. This is a good, clear, non-jargon-heavy (if repetitive) explanation of the concepts of Zen and how to begin th This is my 100th read of the year! Obviously, boasting about this is a form of spiritual materialism. Sigh. This is a good, clear, non-jargon-heavy (if repetitive) explanation of the concepts of Zen and how to begin the process of putting them into practice, or, more precisely, how to start on the path of living in the now instead of in the past, the future or in a false and unfulfilling realm marked by our myriad confusions. A lot of this I have already found useful in helping me see things with a more open, forgiving, less possessive perspective. Now, do I actually buy into *all* of this stuff? Maybe not -- or maybe that's just my ego defenses talking. When I first began to delve into Buddhism I though, "Ah ha! Here it is! The TRUTH!!!" At first I thought that I would now just be able to read a few words and: "Wham, bam, thank you , Stan," I'm enlightened. I thought that the truth was supposed to be simple, profound and sublime. If we had to talk about it too much then it couldn't be the TRUTH. Well, I was wrong. Yes, the truth is simple but the way to it is ever unfolding. It takes time, skill and effort to get to it. We must read about it, st When I first began to delve into Buddhism I though, "Ah ha! Here it is! The TRUTH!!!" At first I thought that I would now just be able to read a few words and: "Wham, bam, thank you , Stan," I'm enlightened. I thought that the truth was supposed to be simple, profound and sublime. If we had to talk about it too much then it couldn't be the TRUTH. Well, I was wrong. Yes, the truth is simple but the way to it is ever unfolding. It takes time, skill and effort to get to it. We must read about it, study it, discuss it, practice it and apply it. Over and over and over again. This is what I have gotten out of Chogyam Trungpa's book Cutting Through Spiritual Materialism. The first part of the book deals with the fact that "ego can convert anything to its own use, even spirituality." Trungpa Rinpoche explains how this fundamental pitfall along the spiritual path can be avoided by being ever mindful of the trappings of the ego: discursive thoughts, negative emotions, desires and judgements. Paradoxically, we must also embrace our inner strength and cultivate a great confidence that we will be able to see this path to the end. As Trungpa says, "You must allow yourself to trust yourself, to trust in your own intelligence. We are tremendous people, we have tremendous things in us. We simply have to let ourselves be." The second half of the book dives deep into Buddhist thought and philosophy (which, of course, he shows to be "non-philosophy". Aaarrghhh!!!!) He clearly elucidates the topics of developement of the ego, the six realms of existence (an important aspect of the Buddhist understanding of reality), the Four Noble Truths, and the concept of emptiness. All of the chapters, each of which was transcibed from a lecture series he gave in the early 70's, is followed by a question and answer section which clarify the topics even further. The concept of Spiritual materialism is very powerful. Not sure I fully understand it yet. After reading the book I immediately wanted to go back and reread it, because I know I will get a lot more out of it. Seldom do I read a book twice and then it is usually because I have forgotten I've already read it. This may be a volume I pick up and add to my library so that I can high light passages in it. If I understand it right, Spiritual materialism applies not just to Buddhism, but to all spiritual The concept of Spiritual materialism is very powerful. Not sure I fully understand it yet. After reading the book I immediately wanted to go back and reread it, because I know I will get a lot more out of it. Seldom do I read a book twice and then it is usually because I have forgotten I've already read it. This may be a volume I pick up and add to my library so that I can high light passages in it. If I understand it right, Spiritual materialism applies not just to Buddhism, but to all spiritual practices. It is were the Ego gets bound up in the rewards of the practice and then gets in the way of making real advancement. This is one of the most important books I've read in my life. I highly recommend it to anyone considering Buddhism. Trungpa asks important questions about the motivation for faith in a materialist culture. For example, are you drawn to Buddhism because it's got a nice aesthetic or because you are ready to commit to some very difficult spritual practice? This book could have been so much more than it was. I was really excited by the summaries on Amazon from people who had read this book, and so I ordered the book right away when I discovered it. Unfortunately, the structure of the presentation leaves so much to be desired that I almost gave up about halfway through the book. Based on the reviews I had seen and the title of the book, I was expecting a book with a straightforward premise that it is trying to argue regarding the pitfalls of spiritua This book could have been so much more than it was. I was really excited by the summaries on Amazon from people who had read this book, and so I ordered the book right away when I discovered it. Unfortunately, the structure of the presentation leaves so much to be desired that I almost gave up about halfway through the book. Based on the reviews I had seen and the title of the book, I was expecting a book with a straightforward premise that it is trying to argue regarding the pitfalls of spiritual approaches that connect the idea of self-improvement with spiritual growth. Instead, this book is a series of lectures given in 1970-1971, so my hopes for a tight argument pretty much had to go out the window. Even worse, most of the argumentation was presented initially through metaphor. I got lost somewhere in the middle when the monkey decided to live in a house with no exits, all the while ramming himself into the walls that he made real. All the talk of monkey realms, human realms, realms of passion, etc., really detracted from my desire and ability to pay any attention to the lecturer. Luin tämän suomeksi (Henkisen materialismin ylittäminen), mutten löytänyt täältä suomenkielistä versiota. Anyway, on ilo lukea kirjaa, jonka aiheen kirjoittaja tuntee säälimättömän läpikotaisesti. (Trungpa pakeni Tiibetistä vaikeissa olosuhteissa 1959 Intiaan, josta myöhemmin muutti Amerikkaan ja alkoi opettaa siellä). Trungpa käy alussa läpi itsepetoksen muotoja ja selventää mm. egon käsitettä (jonka merkitys buddhalaisessa "filosofiassa" on eri kuin länsimaisessa mielessä). Kirjan jaksoja ovat Luin tämän suomeksi (Henkisen materialismin ylittäminen), mutten löytänyt täältä suomenkielistä versiota. Anyway, on ilo lukea kirjaa, jonka aiheen kirjoittaja tuntee säälimättömän läpikotaisesti. (Trungpa pakeni Tiibetistä vaikeissa olosuhteissa 1959 Intiaan, josta myöhemmin muutti Amerikkaan ja alkoi opettaa siellä). Trungpa käy alussa läpi itsepetoksen muotoja ja selventää mm. egon käsitettä (jonka merkitys buddhalaisessa "filosofiassa" on eri kuin länsimaisessa mielessä). Kirjan jaksoja ovat mm. Antautuminen, Itsepetos, Huumorintaju, Kuusi maailmaa (paramitat), Neljä jaloa totuutta, Shunyata, Prajna ja myötätunto, Tantra. ..."todellinen kokemus, unelmamaailman tuolla puolen, on todellisen nyt-hetken kauneus, värikkyys ja jännitys arkilämässä. Kun kohtaamme asiat sellaisina kuin ne ovat, lakkaamme toivomasta jotain parempaa." I bought this book in 2004 and let it sit on my bookshelf in California, Austin, then Guatemala until finally reading it this spring. It's the kind of book I want to reread as soon as I finish. Tibetan meditation master Chögyam Trungpa clearly explains how "walking the spiritual path properly is a very subtle process; it is not something to jump into naively. There are numerous sidetracks which lead to a distorted, ego-centered version of spirituality," and how to avoid these pitfalls on the path I bought this book in 2004 and let it sit on my bookshelf in California, Austin, then Guatemala until finally reading it this spring. It's the kind of book I want to reread as soon as I finish. This book is a re-read. First time I read it, I was seeking spiritual truth. Well, to be honest, it was very difficult, very layered. I read it to get something out of it, and was very disappointed. 2nd time through, I happened to be cleaning my book shelf up, and it fell out and open to a page on experiencing anger. I was just drawn in, and discovered to my delight that rereading this book was an entirely different experience. Straightforward, exact, precise, a joy to read, and a great pleasure This book is a re-read. First time I read it, I was seeking spiritual truth. Well, to be honest, it was very difficult, very layered. I read it to get something out of it, and was very disappointed. 2nd time through, I happened to be cleaning my book shelf up, and it fell out and open to a page on experiencing anger. I was just drawn in, and discovered to my delight that rereading this book was an entirely different experience. Straightforward, exact, precise, a joy to read, and a great pleasure. I was literally up until wee hours and awake at wee hours. Couldn't put it down. Not unlike air for breathing, I highly recommend it for anyone considering starting a spiritual practice, or who just has an interest in Buddhism from the Tibetan perspective. One of those books that really needs to be read many times throughout the course of a life... it will reveal new things each time. Many books provide comfort or guidance, this one is like a mirror and what you see in it depends on how much you are willing to see... and what you see isn't often very pretty. Reviewing books on Buddhism presents unique challenges, at least for me. The first of these is disentangling the wisdom contained in a great extant corpus, such as Buddhism's—which every modern text draws from—from the contributions unique to the text in question. This is often complicated further when the reader already has some expectations from or, dare I say, reverence for some or other portion of that corpus. One begins to bring those concepts with him to every text, along with his preconce Reviewing books on Buddhism presents unique challenges, at least for me. The first of these is disentangling the wisdom contained in a great extant corpus, such as Buddhism's—which every modern text draws from—from the contributions unique to the text in question. This is often complicated further when the reader already has some expectations from or, dare I say, reverence for some or other portion of that corpus. One begins to bring those concepts with him to every text, along with his preconceptions, and this can lead to an undeserved suspension of criticism. The benefit of the doubt is given a little too freely. Or perhaps the opposite is the case, where one refuses to admit a view which contradicts his own mean interpretation. This is not a problem exclusive to Buddhism. It confronts any attempt to deal with fundamental existential problems while drawing from a preexisting scaffold of mature cultural and intellectual assumptions. If Western Philosophy were still taken seriously as a tradition with dire consequences for the individual, I would say the same of those texts. Unfortunately, most of the vitality of that tradition has been sucked out or crushed under its own weight, obsolescence, or elitism. In becoming dead and respectable, a subject for conscientious autopsies and gleeful post-postmortems, Western Philosophy has inured itself from the kind of chicanery which inevitably arises within, and which can be used to easily discredit, a tradition which claims to offer real spiritual benefit to the individual. But Buddhism is uniquely vulnerable to exploitation in another way. One of its tenets, after all, is non-dualism, and a kind of suspension of judgment. This is a notion that can be understood in one of its facets as "surrender." "Surrender" is a word that Trungpa uses repeatedly. I think there is a place for surrender, but I can't think of many forms of devotion quite so dangerous if misunderstood. While reading Cutting Through Spiritual Materialism, I found myself grappling with my objectivity over and over. Moments of personal agreement and recognition punctuated an often disjointed, hazy, and unsatisfying set of talks. At his best, Trongpa conveys the many dangers of bringing misplaced egoism into a spiritual journey, but he addresses the substance of that journey only intermittently and superficially. The first half of the book deals with this notion of spiritual materialism and ego-inflation, which I think is an important and useful topic. But the antidotes he seems to prescribe in places feel vaguely cultist. At times Trungpa seems downright dissembling, especially in these "Q&A" sections, which seldom make anything clearer. This applies especially to the talks on Gurus or, as they are known in this tradition, "spiritual friends." Trungpa removes all doubt about subtle interpretations about whether one needs a guru, or whether that guru need be made of human flesh, by answering a question point blank: one must have a guru to achieve the kind of openness of which he speaks, and this guru must be a real, material, and proximate human being. To me, this kind of broad statement reeks of sectionalism and cultural conservatism and conflicts with the principle that there are manifold paths to enlightenment. On the other hand, Trongpa is also careful to deflate the notion of "spiritual friend" as some kind of perfect teacher or saint. Indeed, he makes some wonderful points about flexibility and extracting wisdom and whatever is to be learned from any situation or person, regardless of how one may be disposed to categorize or objectify said people or situations. But then he turns around and dismisses approaches outside of his idiosyncratic emotional transmission. This felt rather flim-flam, especially when one considers Trungpa's status as a leader of a kind of religious commune in the sixties, coming in contact with celebrities, and getting into some controversial and hardly saintly situations. I don't normally like to consider ad hominem arguments when contextualizing a text, but when the topic is as fraught for abuse as this, it strikes me as prudent to consider the source. And both the source and the text seem rife with subtle contradictions and misty thinking. I am not saying that these views are unjustifiable, but the author didn't bother to justify them here. So the first half of the book is useful, but to my thinking, substantially marred for the general reader. Moving onto the second half of the book, the topicality on "spiritual materialism" more or less evaporates into a rather straightforward summary of various Buddhist doctrines from different schools of the various "vehicles." This is the sort of thing you would expect from an introductory series of talks. I was much more engaged with this material, but I couldn't help thinking that the purpose would have been better served by giving more time to the titular subject, or else expanding upon one or more of these fundamental doctrines in its own right, any one of which stands up to a lifetime of study. Why tumble through all this so haphazardly? Its inappropriateness as an introduction, I think, became obvious to me when I noticed myself filling in the blanks with what I knew, but when coming to something I knew little about (vajrayana/tantra, for instance) I was struck by how new-agey and hand-wavy it seemed. Maybe this is just a feature of that flavor of practice, or maybe Trungpa is just not doing the reader a lot of favors in summarizing these doctrines. Cutting through Spiritual Materialism by Chögyam Trungpa is clearly divided into two halves: the first one, which could also be called "Cutting through Spiritual Mumbo-Jumbo" deals with the perils and traps that come during the spiritual path as a manifestation of the everlasting desire of the ego to pervade every single aspect of a person's life. In this aspect, Trungpa masterfully puts his audience (us) in its place in almost every wrong road they may have taken during their (our) limited spiritual path, clearly exposing how and why this happened, and the way to overcome it. Never before have I felt such a sense of being talked to by a book in terms of telling me not what to think about myself or my practice as with this one. In the second part, Trungpa discusses fundamental topics of Mahayana Buddhism, such as the Six Realms of existence, the Paramitas, Sunyata and even Tantra. The thing is, though very engaging at times, Trungpa's innovative style of presenting these topics does not click with him - not completly. Please don't get me wrong: I do love his irony, his straightforwardness and his vast knowledge, which he manages with such dexterity to convey in an accessible manner. No; what I do not like is when he starts redefining traditional concepts in a way the Western audience will be more likely to understand it and integrate it into their existing schemas. And, in my very humble opinion, this may lead to a number of misinterpretations which can eventually lead to people falling into the errors presented in the first half - namely, being so concerned about embodying the characteristics and attributes Trungpa explains that you end up with a massive ego clad in spiritual gibberish (not Trungpa's, but their misinterpretation). That's why I'm not giving this book five stars. As with "Shambhala", I find the way of presenting the teachings very exciting and, especially, inspiring, but no concise instructions about how to integrate them into everyday life are provided. That's precisely one of the things that makes me love Tibetan Buddhism - how detailed is every step of the path, how you are provided with specific practices for each and every one of them. On the contrary, here Trungpa tends to use instructions as "just completly surrender to what already is" and/or "completly let go of any conceptions and just be" (just paraphrasing here). My question is here is, how? How do I do that? How do I achieve that state ? I must also add that this book is an edited collection of transcripts of a series of talks Trungpa gave in 1970 and 1971 to a very specific set of audiences, and thus it might be understandable that he spoke what he spoke in the way that he did for a very good reason - to benefit that very audience. Thus, in taking the context out of the teaching in the form of a book, the issues I find troublesome (at least, for me) are more or less bound to happen. In any case, I strongly recommend this book to anyone intersted in seriously pursuing any spiritual path (first half of it), reviewing already familiar Buddhist concepts (second part), or to anyone wishing to read one of the greatest, most challenging Tibetan Buddhist teachers of the 20th Century. Más allá del Materialismo Espiritual, de Chogyam Trungpa, está clarametne dividido en dos partes: la primera, que también podría llamarse "Más allá de las tonterías espirituales" trata de los peligros y las trampas que ocurren durante el camino espirtual como manifestaciones del siempre presente deseo del ego de permear todos y cada uno de los aspectos de la vida de una persona. En este aspecto, Trungpa pone magistralmente a su público (nosotros) respecto a casi cualquier camino equivocado que puedan haber tomado durante su (nuestro) limitado camino espiritual, exponiendo claramente cómo y por qué ésto ocurrió, y la manera de superarlo. Nunca antes había sentido una sensación semejante de que un libro me estuviera hablando, en términos de decirme qué no pensar sobre mí o sobre mi práctica, como me ha ocurrido con éste. In la segunda parte, Trungpa habla sobre los temas fundamentales del Buddhismo Mahayana, como los Seis Reinos de existencia, las Paramitas, la Vacuidad e incluso el Tantra. El asunto es que, aunque muy interesante en algunos momentos, el estilo innovador de Trungpa al presentar estos temas no termina de encajar completamente conmigo. Por favor, no me malinterpreten: me encanta su ironía, lo directo que es y el conocimiento tan vasto que tiene, que se las arregla de una manera tan diestra para transmitir de una manera accesible. No; lo que no me gusta es cuando comienza a redefinir conceptos tradicionales de manera que sea más probable que su público occidental los entienda e integre en sus esquemas. Y, en mi muy humilde opinion, esto puede llevar a un número de malinterpretaciones que pueden terminar llevando al público a caer en los errores prsentados en la primera parte - principalmente, estar tan preocupados por personificar las características y atributos que Trungpa explica que terminen con un ego gigantesco vestido con charlatanería espiritual (no la de Trungpa, sino su malinterpretación). Por esto es que no le estoy dando a este libro cinco estrellas. Como con "Shambhala", encuentro que la manera de presentar las enseñanzas es muy interesante y, especialmente, inspiradora, pero que no se dan instrucciones concisas sobre cómo integrarlas en el día a día. Esto es precisametne una de las cosas que me hacen amar el Buddhismo Tibetano: cuán detallado está cada paso del camino, cómo se te dan prácticas específicas para todos y cada cada uno de ellos. Por el contrario, aquí Trungpa tiende a utilizar instrucciones como "tan solo ríndete a lo que ya es" y/o "suelta completamente cualquier concepción y simplemente se" (solo estoy parafraseando). Mi pregunta aquí es, ¿cómo? ¿Cómo hago eso? ¿Cómo alcanzo ese estado? También he de añadir que este libro es una colección editada de las transcripciones de una serie de charlas que Trungpa dio en 1970 y 1971 a un público muy específico, y que por lo tanto puede ser comprensible que él habló lo que habló y de la manera que lo hizo por una muy buena razón: beneficiar a ese público en concreto. Por lo tanto, al sacar el contexto de la enseñanza en la forma de un libro, los temas que encuentro problemáticos (al menos, para mí) son más o menos inevitables. We must surrender our hopes and expectations, as well as our fears, and march directly into disappointment, work with disappointment, go into it, and make it our way of life, which is a very hard thing to do. Disappointment is a good sign of basic intelligence. It cannot be compared to anything else: it is so sharp, precise, obvious, and direct. If we can open, then we suddenly begin to see that our expectations are irrelevant compared with the reality of the situations we are facing. This automatically brings a feeling of diasppointment. The Buddha... was not a religious fanatic, attempting to act in accordance with some high ideal. He just dealt with people simply, openly, and very wisely. His wisdom came from transcendental common sense. His teaching was sound and open. Q. Is it absolutely necessary that the spiritual friend be a living human being? A. Yes. Any other "being" with whom you might think yourself communicating would be imaginary. Q. Would the teachings of Christ in themselves be a spiritual friend? This isn't just about spiritual materialism. There are plenty of other topics covered. I hadn't been too thrilled about some of Trungpa's other books but this one was impressive. This book wasn't perfect (I didn't like some of the chapters or the Q&A sections at the end of most chapters), but I will reread it if I can't find a better Trungpa work. An excellent book for those people on just about any spiritual path, but particularly those who follow Eastern philosophy. Chogyam Trunga wrote this book for his students who were so into attaining enlightenment, nirvana, etc, they began thinking they didn't need to care for themselves on the earth plane (i.e, feeding oneself, washing, sleeping, etc,). In short, they were becoming becoming a bit too self-righteous, which is rather at odds with the philosophy itself. Trungpa became alarmed at thi An excellent book for those people on just about any spiritual path, but particularly those who follow Eastern philosophy. Chogyam Trunga wrote this book for his students who were so into attaining enlightenment, nirvana, etc, they began thinking they didn't need to care for themselves on the earth plane (i.e, feeding oneself, washing, sleeping, etc,). In short, they were becoming becoming a bit too self-righteous, which is rather at odds with the philosophy itself. Trungpa became alarmed at this reaction, as to him, it appeared as a form of spiritual egotism or "materialism" if you will. His students questioned "Why take care of our physical selves, when the attainment of enlightenment promises a transcendence of this earthly existence and all its attendant woes, including death? Why not aid the process?" Really? According to Chogyam Trungpa's teachings and eastern philosophical thought in general, we are all here on this plane and in these bodies, leading these lives for a reason; the main reason being the we are charged with taking the best care of our bodies that we can so we may learn well from and meet head-on whatever challenges life, Karma and our relationship to Maya may set before us. Very likely the best and most direct book I have read about how to proceed in becoming more awake. Chögyam Trungpa wasn't know as a challenging teacher for no reason. This book will kick most every seeker in the teeth more than once before the book is finished. Chögyam Trungpa points out the road blocks, detours, and pot holes that most everyone encounters on the journey to greater awareness. At least the reader of the book stands a chance of being aware of what is happening to them. Just reading Very likely the best and most direct book I have read about how to proceed in becoming more awake. Wow. It took me a long time to read this book. I loved every word. It was difficult. It made me feel uncomfortable. Trungpa has such a way with words, he makes even the most complex concepts easy to understand. If I had read this book a year ago I would have had a hard time understanding it. I can't say that I have a better understanding of myself; that's not what this book is about. I do however see patterns in my thinking more clearly. Thankfully.